53601 cyan inkjet cartridge for Bravo 4100, 4051, 4101, 4102 publishers and autoprinters. 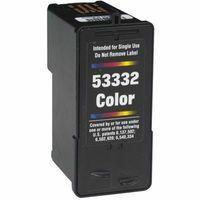 53602 magenta inkjet cartridge for Bravo 4100, 4051, 4101, 4102 publishers and autoprinters. 53603 yellow inkjet cartridge for Bravo 4100, 4051, 4101, 4102 publishers and autoprinters. 53604 black inkjet cartridge for Bravo 4100, 4051, 4101, 4102 publishers and autoprinters.